The project was a planned second phase of construction for the plant, originally commissioned in 2009 to treat drinking water from the Central Arizona Project’s Colorado River watershed. The Arizona Water Association selected Santan Vista for its success and efficiency in doubling the plant’s water capacity on time and below budget. In fact, the project saved approximately $15 million in program costs compared with the original estimate, a 20% cost reduction. The award also cited the project team’s strong, collaborative working relationship and the careful planning that minimized shutdown time to maximize facility operations. WesTech’s primary role in the phase II project was providing the company’s proprietary RapiSand™ ballasted flocculation system for water clarification. As a source for quality drinking water, the Colorado River requires the removal of organic carbon and suspended solids. As originally constructed in phase I, the Santan Vista WTP included two ballasted flocculation clarification trains, each with a capacity of 12 MGD, for a total of 24 MGD. These had been supplied by a competitor; however, when it came time for expansion, the plant’s designers and engineers chose to open the competition to other equipment suppliers, and ultimately selected WesTech’s RapiSand. Ballasted flocculation is a high-rate, physical-chemical clarification process involving the fixing of flocs, or suspended solids, onto microsand ballast with the aid of a polymer. Due to the large number of particles, the microsand provides a larger contact area for binding and the coagulated solids form a dense, ballasted floc. The RapiSand system from WesTech uses rapid mixing and multi-stage flocculation, in combination with enhanced settlers to increase sedimentation velocities by a near factor of 10. RapiSand’s extremely fast sedimentation process has a wide variety of applications and uses in the removal of suspended solids. Rapid start-up times. Total flocculation time is typically eight minutes, which is a fraction of the time required in a conventional flocculation system. During the clarification step, the ballasted floc settles up to 35% faster as well, so that total detention time in the RapiSand system is typically 20 minutes from start to finish. Relatively small site requirements. Rapid flocculation and settling combine to reduce the space requirement for a ballasted flocculation treatment train by up to 90% for RapiSand vs. a conventional clarification. Excellent performance. 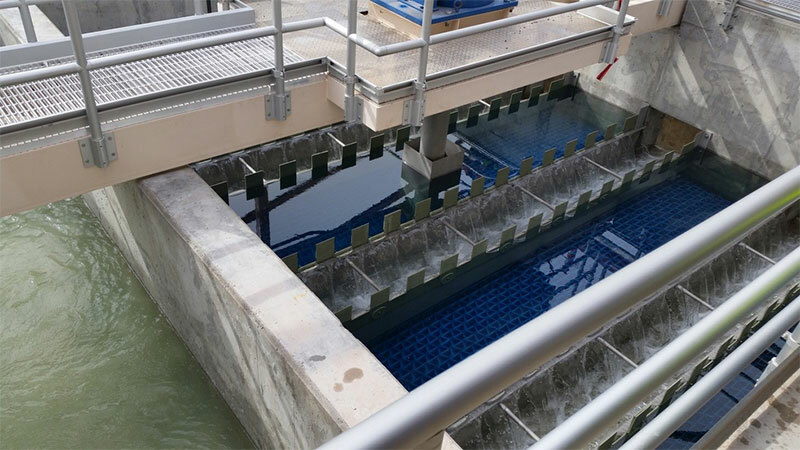 In terms of both turbidity and total suspended solids (TSS), ballasted flocculation’s high rate of sedimentation provides great performance characteristics, leaving behind a highly clarified effluent. Typical outlet turbidity is less than 2 NTU. Due to the stability of the ballasted flocculation process, RapiSand can handle large spikes in raw water turbidity. WesTech unveiled the RapiSand ballasted flocculation system in 2009, just after completion of phase I of Santan Vista. The plant’s designer, engineers, and construction firm, who during phase I had just one ballasted flocculation product to choose from, were happy this time around to have more than one option. In addition to the comparative quality of WesTech’s RapiSand system at a lower cost than the competitor’s, WesTech also provided a full-spectrum extended warranty and ongoing maintenance. “We told them that if something didn’t work right, we’d fix it, no questions asked, so it was very minimal risk for them to choose WesTech over the competition, while incurring significant savings of one to two million dollars,” says Sturgeon. WesTech also stood out for the company’s ability to provide in-house electrical expertise. WesTech engineers conducted a complete evaluation and upgrade of the existing control panels and programming as well as an expansion and modernization of the system to handle the plant’s doubled capacity. “This is a big plus of working with WesTech, that we have the expertise to do that all in house, and don’t have to subcontract with anyone,” says Sturgeon. The new control panels include remote operation and seamless communication between all components in the system, both existing and new. Thanks to the success of the Santan Vista phase II project, WesTech is receiving a great deal of interest in RapiSand and inquiries about future project potential. And as the government tightens regulations on power plant emissions, for example, RapiSand is an attractive option, in particular for its ability to clean up mercury. The RapiSand ballasted flocculation system is starting to take off in other ways, too, particularly in the deployment of mobile units, which is a relatively new offering for WesTech. The RapiSand ballasted flocculation mobile units are perfect for transitional situations, such as while a plant rehabilitates or replaces old equipment. “A facility might also use a mobile unit when they’re starting up a new section of operation that’s going to generate its own stream of water that needs to be treated. This gives them the time they need to develop a permanent solution,” says Sturgeon. WesTech currently has two 500-gpm mobile RapiSand units in operation, with more on the way. For media inquiries, please contact Communications Specialist Michele McFee at media@westech-inc.com or by phone at 801-265-1000.